What a weekend it’s been. I had a great time seeing friends, experiencing Rhode Island, and running my seventh marathon, the Cox Rhode Races Marathon! Let’s jump right into the race report. Apologies in advance for the lack of pictures! So going into this weekend, I was excited for the race but I was more excited to see my friends who I hadn’t seen in 2 years. So I was trying to not be too much of a Debbie downer when it came to saying no to activities and restaurant choices. I tried my best to eat right and not move around too much before the race but it was hard because it’s a freakin’ gorgeous state and I was having a blast catching up with my friends! Basically in a nutshell, Providence is historic and beautiful with lots of east coast seaside homes and lots of historic charm. The expo for the event was held Friday, Saturday, and Sunday morning in the Rhode Island Convention Center near the race start. On Sunday there was a 5k, Half Marathon, and Full Marathon all starting about a hour apart from each other. Since I didn’t want to side track the whole crew on Saturday, I decided to do bib pick up the morning of. It worked well and there were even a few vendors open at 6am with some nice products. The down side to doing late pick up was that there were no more size small race shirts, so I ended up with a shirt that’s too large for me. Oh well I can turn it into a pillow or finally make a T-shirt blanket or something. I grabbed my bib and then got myself together (sunscreen, got my spibelt together, used a real bathroom, etc). I even saw Mickey Milers Kimberly and Gail briefly before they went back to their hotel to get ready! They were running the half which started 30 minutes after the marathon. Going into the race I was feeling good. 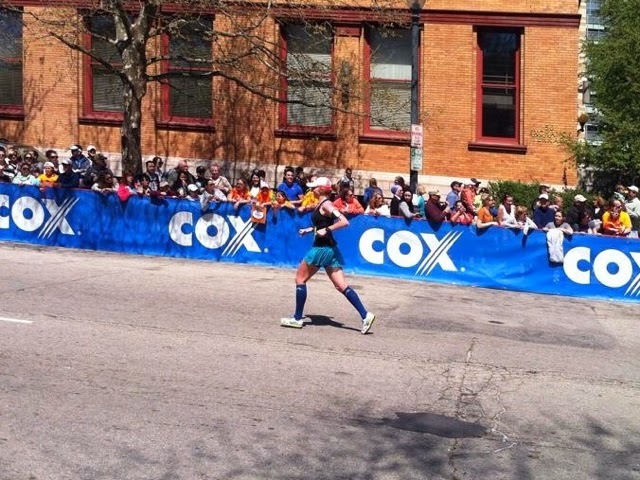 I was ready to get a new PR with a stretch goal of Boston qualifying!
. It was a field of about 3,000 marathoners so it was a good sized group but not overwhelming or crowded. The start was delayed so we weren’t off until 7:40 after hearing the National Anthem sung by Beyonce (it was a recording, no Beyonce wasn’t there)! 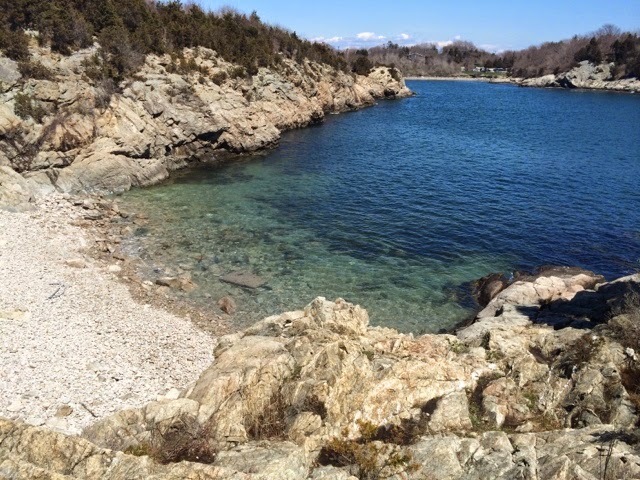 The early miles wound through some areas of Providence and then over a bridge, which took us to paths along the water on the east side of the bay. I’d say for about 70% of the race you could see the bay which was really nice and meant we had some nice breezes the whole time. We ran on the roads for some of the race and it was odd because they only sectioned off the shoulder+half the right lane for runners meaning there was 2 lane traffic for most of the race that was scrunched into a lane and a half. It made me nervous at first but I got used to it and traffic wasn’t heavy or fast so it wasn’t too bad. The whole course was a mixture of streets like this and bike paths and there were lots of small groups of cheerers for most of the way. Also, since we were pretty close to Boston (okay not super close but closer than California) there were lots of people wearing Boston apparel which was super inspiring! Personally my race went like this. I was feeling great for the first 10 miles. I was running a bit faster than I had planned but I just felt great. My breathing was under control, my shoulders felt relaxed, and my legs felt great. I felt unstoppable. At about mile 10 I was still feeling really strong so just kept going at this slightly faster pace. At about the halfway point I could feel my tummy start to churn. It was manageable until I hit mile 18 and that’s where it got dicey. It really started to hurt and I started to get “those feelings”. I tried to recover but for the rest of the race I felt nauseous and like I needed to use the restroom and by the end was completely dehydrated because I didn’t want to drink too much water for fear of more tummy troubles. It was rough. After such a great start and a first half that put me on pace to BQ (1:47 was my half split time), I just fell apart in the last 8 miles. 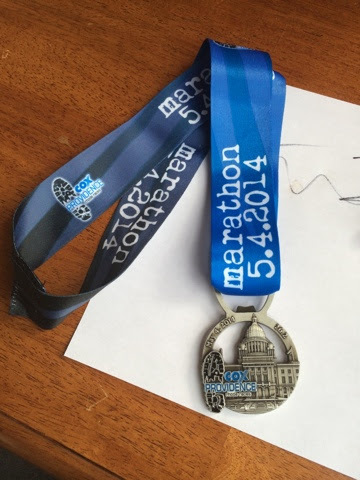 It was a good reminder for me to never underestimate the marathon. Just when I thought I’d figured it out, it threw this fun curve ball. Overall though, I still walked away with a new PR and I can know say I’m a sub 3:45 marathoner with a finish time of 3:44:56, so even for such a bad finish, it was still a great accomplishment. I need to figure out my plan though for my next one. I know for the next one I try to really push, I’m going to make it a running specific trip/weekend and be slightly neurotic about my nutrition before. It’s just not worth it if I’m running for time.